The advantage shifted twice in the prestart, then the Defender got away first by more than a minute, which in these boats is a huge distance. But. USA passed Alinghi 5 less than 15 minutes into the first race of America’s Cup 33, and from there the challenger never looked back. It’s 1-0 in a best-of-three match. 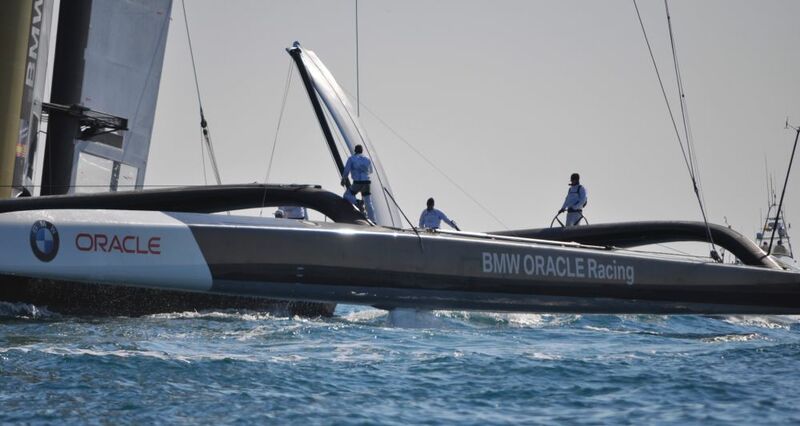 The BMW Oracle crew was prepped for exactly the weather of the day. Alinghi was out of mode. 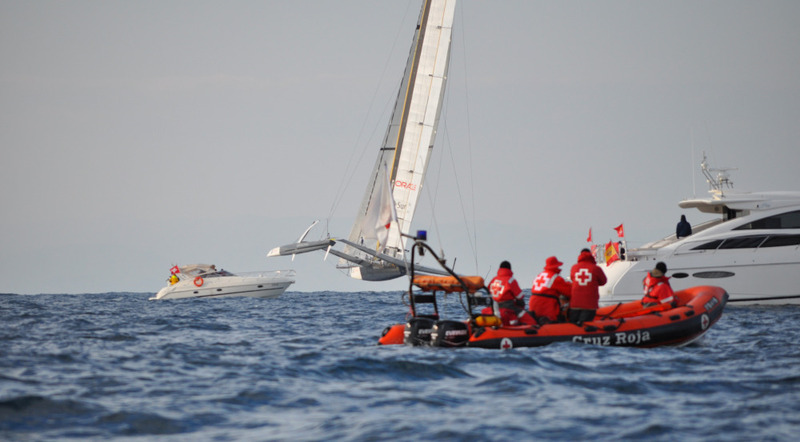 Did Alinghi’s weather team miss a big one? You’re Jimmy Spithill and you’re no longer a kid but not by much and it’s your fourth America’s Cup already and it’s your third attempt at a delayed Race One when you wake up in the middle of the night and look out the window at the very cold and very dark and it’s time. Time to suit up. Time to put your game face on. Time to “arrive” at the team dockout in the floodlights with the music blaring and flags waving, and you get through that silliness and it seems like forever but soon enough you’re away from the dock and you’re awake from the adrenalin and the winter chill and the dawn has yet to touch the horizon but now it’s just you and your mates. De Ridder shapes the wing and the boat comes alive. You’re Jimmy Spithill and it’s Race One of the 33rd America’s Cup. You’re the skipper/driver of the BMW Oracle trimaran on starboard entry to the start box and keen to re-up that moniker of “Jessie James” Spithill that Paul Cayard hung on you when you were tearing up the competition in the prestarts of AC 32. Your ride, USA, drew starboard entry which in normal match racing is a huge advantage for pre-start maneuvers but in AC 33 the teams have altered the box to allow the port-tack boat, the Alinghi catamaran, to enter low in the box to avoid a high-speed head-on and some people have even speculated the port is advantaged, and here we go. You’re Jimmy Spithill and, wow, forget about the Alinghi guys and their talk about sailing underneath you for the right-hand side of the box and then fighting back on starboard. We’re headed for a dialup and very quickly we’re in a dialup and both boats are going to go over the line and Alinghi’s looking vulnerable and (Beauty!) you’ve nailed them with a penalty. You’re Jimmy Spithill and you’ve just hammered those guys, but wait, you’ve let yourself get too close. This isn’t looking good. 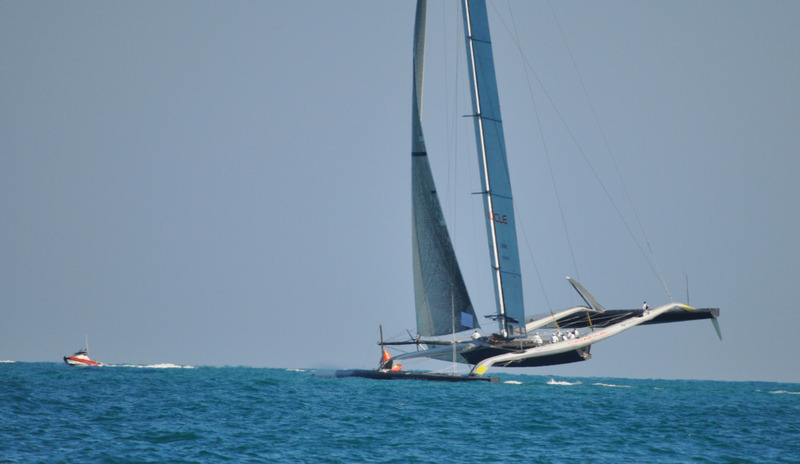 You’re slipping ahead which is not what you want but with that 223-foot wing there is no such thing as head to wind and (no time for expletives) Alinghi is spinning away, escaping. Your trimaran is stalled. STALLED. And Alinghi is gone, more than a minute gone as you finally get some flow attached to the wing and slowly (slowly) dip the line and make a start. You’re Jimmy Spithill driving what has been touted as the great gee-whiz sailing machine of the moment and you nailed your opponent with a foul in the prestart, then hung yourself by going into irons and entering the course with an excruciating deficit but finally you’re on the course. Your tactician, John Kostecki, wants to go to the right, with Alinghi, and he’s your man and now you’re on your way. Just a few minutes on your way you think you see something. JK thinks he sees something. 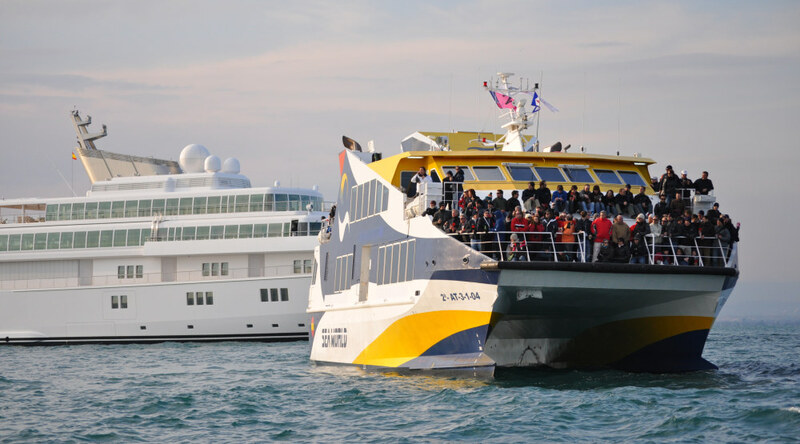 You’re sailing higher and faster. Both teams called the conditions shifty and challenging, though there was a minimum of tacking. To this reporter’s eye, the tri appeared far more stable on the upwind leg. While the cat was one instant flying a hull high and another instant dropping it, the tri looked as if was on double rails. USA made two tacks to the mark 20 miles to weather and rounded 3 minutes, 21 seconds ahead. Skipper Jimmy Spithill was able to sail lower and faster on the downwind leg—as team members had confidently predicted—and made only one gybe enroute to a finish line delta of 15 minutes, 28 seconds. A rout. Alinghi made an extra gybe to lay the finish and of course gave away time on its penalty turn. Larry Ellison: “It looked like we might start in 3 knots, so Russell (Coutts) and I both got off the boat, to save weight. It’s more stressful to watch. 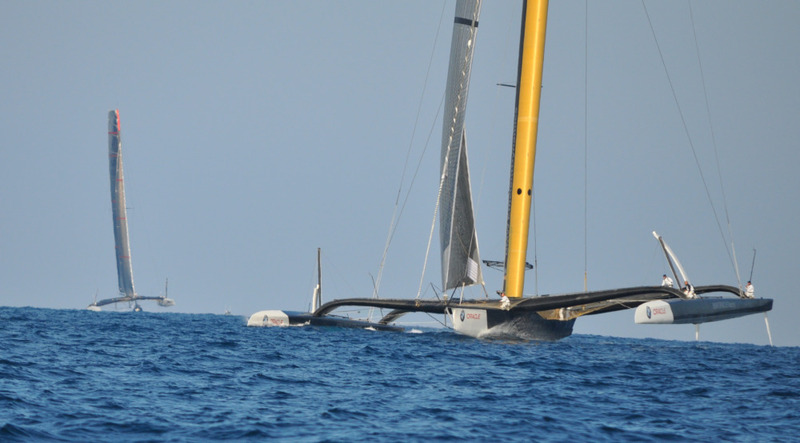 Race 2 of this best-of-three match is scheduled to start on Sunday at 1006, Valencia time. The course prescribed by the America’s Cup Deed of Gift is a 39-mile equilateral triangle. Prospects: A rain front comes through on Saturday and clears by Sunday. The race has a reasonable chance of taking place.